A Venetian castle towers above Chora village on Astipalea island. The quiet and unassuming Dodecanese island boasts beautiful scenery, some of which you can see in the video featured in my post Aspects of Astipalea. Budget friendly: Are you considering a trip to Greece this summer, but wondering where you can go to avoid draining your bank account paying for food and accommodations at expensive destinations like Mykonos and Santorini? Although it’s possible to holiday on a tight budget on both those islands. as well as other high-profile destinations, there are numerous alternatives that offer great Greek holiday experiences at considerably cheaper prices. 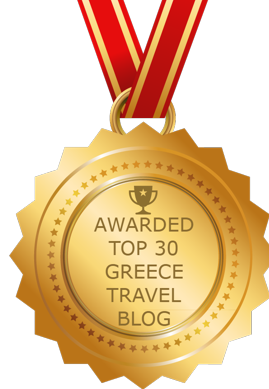 You’ll find some excellent suggestions in the article Best low budget summer destinations in Greece, published by the informative and insightful travel website HIP GREECE. The article lists more than a dozen islands plus one mainland Greece resort area that won’t break the bank, and offers brief descriptions of highlight attractions at each place, with links to additional in-depth articles about some of the destinations. ♦ Parga, a picturesque coastal resort area near the town of Preveza in western Greece. You can read the complete HIP GREECE article by clicking here. We’ve been to three of the recommended islands — Astipalea, Ios and Tinos — and have had brief peeks at the Small Cyclades during port stops on a ride from Amorgos to Naxos on the Express Skopelitis ferry. We would agree that all are good choices for travellers visiting Greece on a budget. We haven’t yet been to the other destinations cited by HIP GREECE, but several friends have told us Kythira, Serifos and Ikaria are wallet-friendly, while others have said the same for the Small Cyclades. However, we were surprised that Naxos wasn’t mentioned — we have found it to be the most reasonably priced island of all we have been to so far and it remains one of our favourite places to visit in large part for that reason. (See my article Our Top 15 reasons to visit Naxos for further information about that wonderful island). Keep in mind that the main tourist period in Greece runs from late April until early October, with July and August being peak travel season. July and especially August also happen to be the most expensive months to visit, so if you’re on a limited budget, try to schedule your vacation for April, May, June, late September or early October, when prices tend to be much lower. Hotel rates usually skyrocket for August, and hostel, camping and cheaper basic accommodations typically tend to book up early in the year. If you can only travel during peak season, make arrangements for your accommodations as soon as possible to secure the lowest prices. Chora village on Ios is chock full of restaurants and bars, while the island is blessed with numerous gorgeous beaches including Mylopotas (which is walking distance from Chora) and Manganari. Intriguing imagery: We have been to Astypalea just once, for an introductory 3-day visit back in 2009, but after watching the video posted above, I regret that we didn’t spend more time there. We missed so many amazing sights! Filmed by Ignasi with a handheld Blackmagic Pocket Cinema Camera, the video follows Eva as she tours the butterfly-shaped Dodecanese island, pausing to admire and contemplate Astypalea’s striking landscape, beach, coast and village scenery. I recognized the spellbinding views from some of Eva’s vantage points, but felt a strong tinge of disappointment that I didn’t get to personally see many of the other sights while we were there. Happily, Eva and Ignasi have shown me plenty of good reasons to consider a return trip. That is so true. The sun is always incredibly brilliant in Greece, but in Astypalea I found it exceptionally intense. Even though I wore sunglasses, I couldn’t stop squinting, and my eyes often watered uncontrollably because of the searing sunshine. Like Ignasi, I couldn’t see anything through my camera viewfinder or LCD screen, either, and most of my photos wound up blurred, overexposed, or poorly framed because I could only point and shoot and hope for the best. (It didn’t help that I was in a jetlag haze much of the time — Astypalea was our first stop on a four-island itinerary that year, and it had taken us well over 24 hours of travel to get there.) You can see the photos that turned out okay in my Astypalea album on Flickr. But do watch Eva and Ignasi’s film a few times — I think it’s remarkable for capturing the allure and charm of Astypalea, and making you feel like you’re actually there, experiencing the island yourself. If you can’t get to Astypalea, this film is the next best thing. Many thanks to Eva for inviting me to publish the film on my blog. This is one of my favourite videos of Greece! GEO magazine profiled Greece in its June 2014 issue with a cover photo of Mandrakia village on Milos and an “Escape” feature on the “Secret islands and archipelagos of Greece.” They’re obviously not secret anymore! Summer reads: When I’m not in Greece I enjoy reading about it — in books, magazines, online travel forums and websites. Thanks to feature cover stories about Greece published by three major European travel magazines recently, I’ve got plenty to read while relaxing on my balcony this summer. 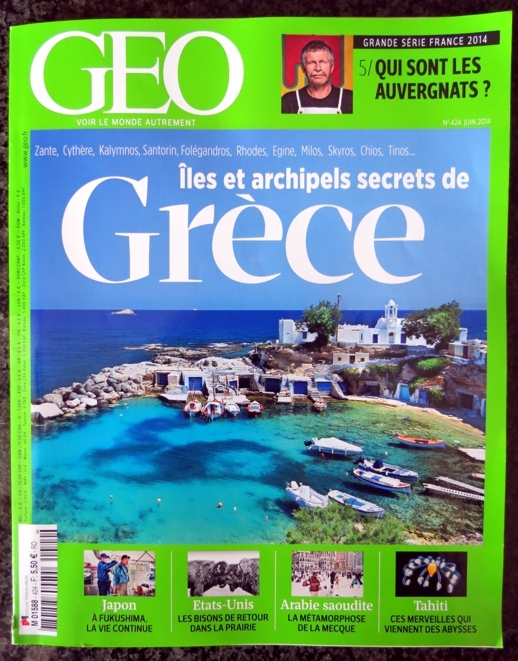 I discovered GEO magazine from France purely by chance — I was looking for another magazine at a newsstand when a photo on GEO’s bold green cover caught my eye. It was the picturesque harbour at Mandrakia, a fishing hamlet on Milos, under the headline: “Secret islands and archipelagos of Greece.” I couldn’t resist and bought the magazine after taking only a cursory glance at the contents. It turns out there are 28 full pages of text and beautiful photos about several Greek islands including Kythera, Kalymnos, Milos, Santorini, Chios, Aegina, Tinos, Skyros, Folegandros and Rhodes. The stories aren’t travel guides — they don’t recommend hotels to stay in, for instance, or suggest the hottest restaurants and coolest beaches to visit. Some of the pieces provide brief descriptions and overviews of the destinations, while others take an insightful look into how the Greek Islands have been affected by the country’s devastating economic crisis. The sale of island real estate to foreign billionaires is considered in part of one report, for example, while another piece profiles people who have started new business ventures selling local agricultural products. Mon Dieu! 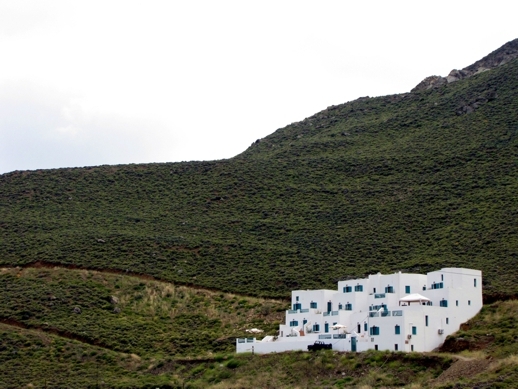 GEO magazine mistakenly published this eye-catching photo of Chora village on Astipalea to illustrate a short piece about Chora on Kythera — another island in a completely different area of Greece. One of the GEO feature’s excellent photos — spread across pages 36 and 37 — really piqued my curiosity. It shows a white-domed church rising from the middle of a huge stone castle perched on a hilltop. The slopes below the castle are stacked with white cube houses that descend to a row of derelict windmills. 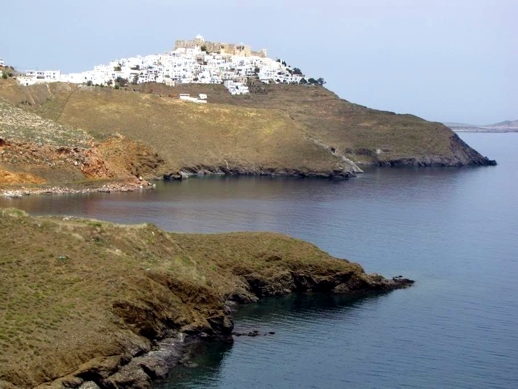 I instantly recognized the location — Chora village on Astipalea, a butterfly-shaped island in the Dodecanese archipelago. I had shot photos from almost the identical vantage point when we visited Astipalea in 2009. 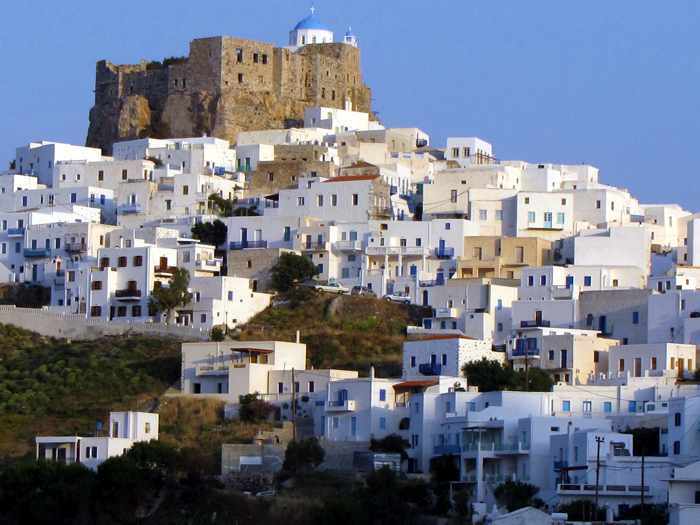 However, the picture accompanied an article about Kythera, which is part of the Ionian island group, and the text said the town in the photo is that island’s capital, also called Chora. 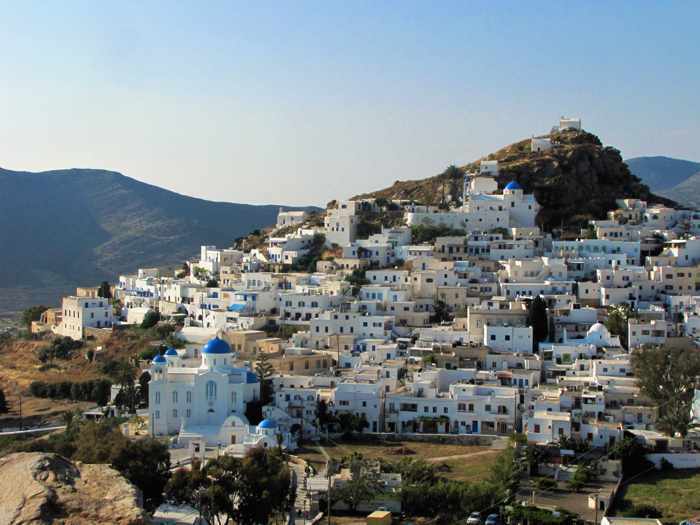 (Most main towns on Greek islands are called Chora). 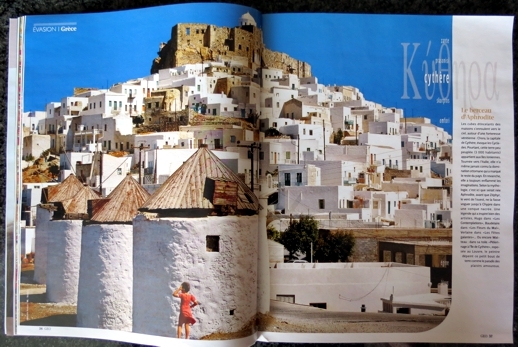 I haven’t been to Kythera yet, but I was absolutely certain the photo was from Astipalea. So I poured through my photos to confirm I was right (there’s more than 300 pictures in my Astipalea collection on Flickr). Sure enough, details in my pictures of Astipalea’s Chora matched the same features visible in the GEO image, which was credited to Velissario Voutsas /IML – Hemis.fr, a French photo agency. Obviously someone on the magazine staff had made a big boo-boo by purchasing the wrong stock image to illustrate the article! Photo flop aside, the GEO stories are compelling reads, and are bound to encourage people in France to consider island hopping in Greece on an upcoming vacation. Moreover, photos and information about Leros, Kalymnos, Chios, Skyros and Tinos will encourage travellers to visit charming islands that often get overlooked because they aren’t instantly-recognizable mainstream tourist destinations like Santorini, Paros, Naxos and Mykonos. Please click on the 2 in the link below to continue reading this report. Suite stay: Seeing some old vacation photos that friends posted online today inspired me to sort through pictures of hotels we have stayed at in Greece and start a “Throwback Thursday” feature to profile some of those places from time to time. To kick things off, here’s a look at the Fildisi Boutique Hotel, which is situated on a hillside near the popular Livadi resort and residential area of Astypalea in the Dodecanese island group. The Fildisi is a small luxury property with only 10 units — 3 suites, 3 lofts, 2 spa-apartments and 2 double rooms, each named after precious gems (Emerald, Opal, Ruby, Sapphire, etc.). The hotel has a seaview swimming pool, along with an indoor breakfast room / lounge / bar area. A basic breakfast is provided each morning. The hotel faces northeast and has an enviable vantage point from its hillside location, with sweeping views of much of the Livadi region as well as the island’s scenic Chora village, which is perched on the crest of a mountain over 1.5 kilometers away. We stayed at the Fildisi in May 2009 on an island-hopping holiday that took us from Astypalea to Amorgos, Naxos and Mykonos. I discovered the Fildisi while doing online research about Astypalea, and must admit I chose the hotel mainly because of its great views. Click on the image to see a full-size photo showing the panoramic view we enjoyed from the two private verandas for the Fildisi’s Pearl suite.